The Geax name has been rebranded under its long-time parent-company Vittoria, but the dependable performance of the Street Runner 26" tire lives on. 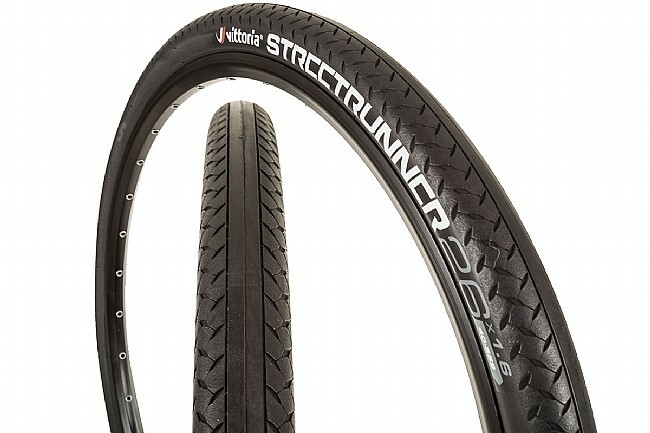 The Vittoria Street Runner's diverse tread design is designed for speed on the straightaways and traction on the corners with a slick center and textured shoulders, converting your old 26" mountain-bike from a trail shredder to a city speeder. Available 26" x 1.25" or 26" x 1.6". Claimed weights are 530 g and 590 g respectively. Wire bead. They grip on leaves and wet pavement so well. Perfect for cummuting. My last tires in this category were Schwalbe Kojak's (32mm) and also Rat Trap Pass tires (50mm) from Compass. So I've gone both routes from narrower tires to super fat. This Streetrunner I got is the 1.6 (40mm) version. I put them on a vintage Nishiki Mtb that had knobbies. My my avg speed went up from 11mph to 14. Through use I found that I prefer these tires to be inflated to maximum pressure at 75 PSI. I ran my rat trap pass tires at 25 psi and my Kojak's at 50 psi. Neither one at maximum pressure, and they gave excellent ride quality and snappy handling or excellent Comfort depending on which Tire I was using it was a great combination of speed and comfort for both. That's what I was trying to point out that at 75 or max pressure on these tires is where I found the best comfort and least rolling resistance but they're lightweight tires and corner well! I really like these tires for the price , a great balance all things considered in performance. Flat protection is not what their design intention was, so I carry a pump and patches. 100 mile per week road rider on nasty streets with lots of tire eating debris. I don't give a lot of 5 star ratings but the Vittoria Street Runner for those who ride a 'mountain bike' on the road earns the stars. The VSR is very well built, easy to mount and rides like a dream. They are long lasting and very puncture resistant (the only flat I've had in the 6 I've bought came on one that was well past its end of useful life). I see a lot of MTB's on the road with fat knobby tires and wonder if they ever leave the blacktop. Most don't look like they ever get into the dirt and all that excess rubber, rolling resistance and poor traction on the road is why I ride the VSR's. That and having tried all the 'bargain' house brands that end up costing more in time (fixing flats) and money. i used this tire on a mountain bike that is only used on paved greenways. Now this bike rides and feels more like my hybrid. My daughter could not stop talking about how much of a difference she felt.